178 pages | 12 B/W Illus. With the ever rising demand for meat around the world, the production of meat has changed dramatically in the past few decades. What has brought about the increasing popularity and attendant normalization of factory farms across many parts of the world? What are some of the ways to resist such broad convergences in meat production and how successful are they? This book locates the answers to these questions at the intersection between the culture, science and political economy of meat production and consumption. It details how and why techniques of production have spread across the world, albeit in a spatially uneven way. It argues that the modern meat production and consumption sphere is the outcome of a complex matrix of cultural politics, economics and technological faith. 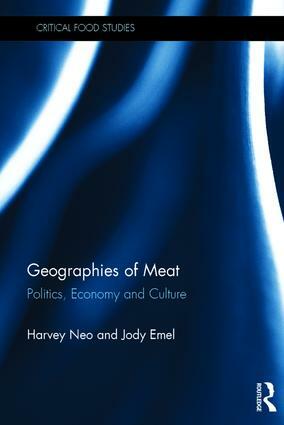 Drawing from examples across the world (including America, Europe and Asia), the tensions and repercussions of meat production and consumption are also analyzed. From a geographical perspective, food animals have been given considerably less attention compared to wild animals or pets. This book, framed conceptually by critical animal studies, governmentality and commodification, is a theoretically driven and empirically rich study that advances the study of food animals in geography as well as in the wider social sciences. "The book expands on critical animalgeographies by focusing on farmed animals, a category which has been largely overlooked. Further, by addressing hierarchy in human-animal relationships, Geographies of Meat also extends and applies concepts from anarchist geography to farmed animals. In Western societies meat is coming to a crossroads, but is finding new markets elsewhere, mostly in Asia. This makes the timing of Geographies of Meat all the more important." Harvey Neo is an associate professor at the Department of Geography, National University of Singapore. His research interests include the political economy of meat, green urban development and geographies of food. He is an at-large board member of the Animal Geography Specialty Group at the Association of American Geographers, and editor of Geoforum and associate editor of Regional Studies, Regional Science. Jody Emel is a professor at the Graduate School of Geography, Clark University, USA. Her research interests include animal geographies, political economy of mining and water resources. Her current research focuses on the political ecology of factory farming. She teaches courses in natural resource development, feminist theory and nature, hydrology, and the relationship between economy and environment.